"The CAP damage or destruction claims are now known to be without factual evidence..."
There, I've saved you all 35 seconds of skimming for that sentence. who served fervently and with great effect despite not having a "kill" to their name. of potential consequences, or examples of places that suffered due to the lack of protection. focus of 30% of it's current activities. I think the conclusion spells that out. 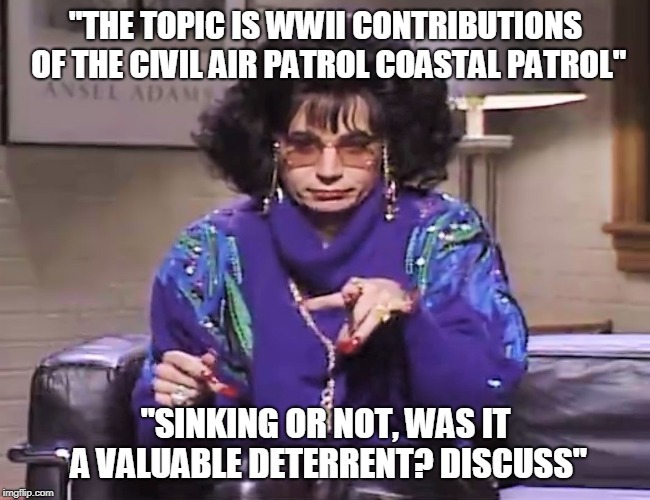 If CAP's Coastal Patrol hadn't stepped into the breech, allowing the Army & Navy time to build a more cohesive defense, and hadn't at least been somewhat effective, we wouldn't have been doing it for 18 months. "This contribution is best measured not in destroyed submarines, but rather the untold numbers of men, ships, and war materiel that arrived safely on foreign shores to help defeat the Axis powers." You should probably be aware, that was written under the aegis of the Smithsonian, not CAP. Guess I'm wondering why it even matters -- damaged or destroyed. It isn't all about that claim, it's about what they did given the resources and the missions. It should be more about the men and women lost in service to their country. The record accomplished by a bunch of volunteers stands on it's own merits, regardless. It isn't ALL about the claims, but it really does matter if CAP is trying or not to set the "we killed U-boats" claims to right. It matters because it says vast things about our individual and corporate ethics. When we unquestioningly push untruths without proof (whether they're just based on poor comm, on eager but self-delusional beliefs, or outright organizational lies in order to inflate our performance to get wartime and post war funding) we compromise our integrity. Core Value time. Even Popes and Marines have lapses (e.g. the collusion to falsify V-22 maintenance numbers to keep that program sold). What we do about it when we discover it is what really matters. So yeah, it matters - a lot. True. I was looking at it from the prospective that a "corrected course" devoid of the "destroyed" claim would not tarnish the organization, given the other aspects of its history. And the author even says that. We had a spectacular WWII record even without "sank 2." How did I miss that meme? !